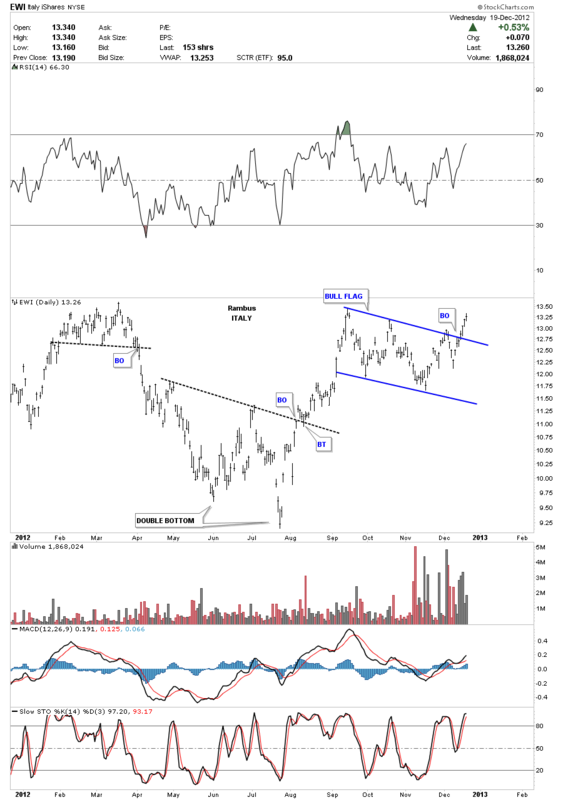 Wednesday Report…Mr Market Throws Mr Goldbug a Wicked Curveball ! 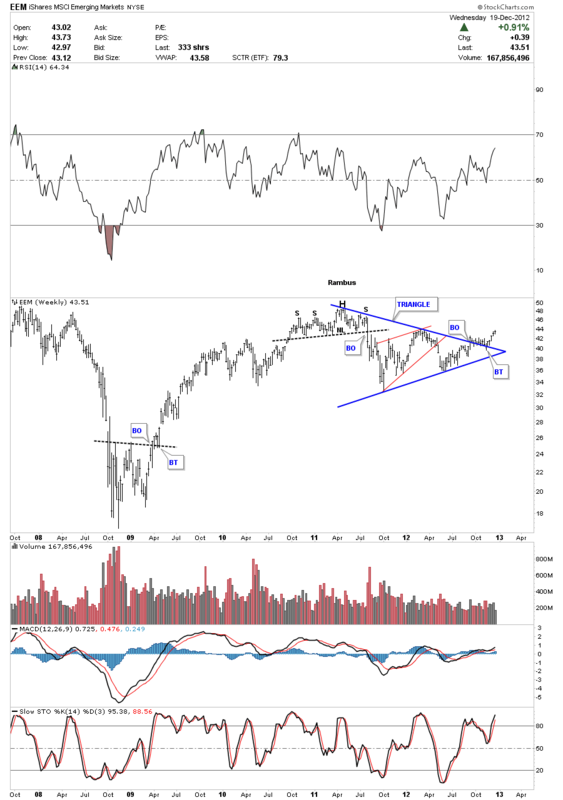 In tonight’s report I would like to show you some charts from different areas of the markets that might shed some light on what is happening with the precious metals complex. The last three weeks or so have been a little complicated with the dollar showing weakness along with the precious metals and their stocks. Normally when you see a weak US dollar that is generally a good time to be long gold and silver. This has been anything but the case so far over the last three weeks. Below is a daily chart of the UUP dollar etf, that shows the somewhat complex topping pattern made back in the summer months of this year. If you recall we went long the model portfolio stocks at the end of July and the first part of August that led to some nice gains as the dollar was falling. The dollar then bottomed out in September and October with a nice little double bottom formation. That started the correction for the PM complex that looked like that’s all it would be, just a correction in a new uptrend. 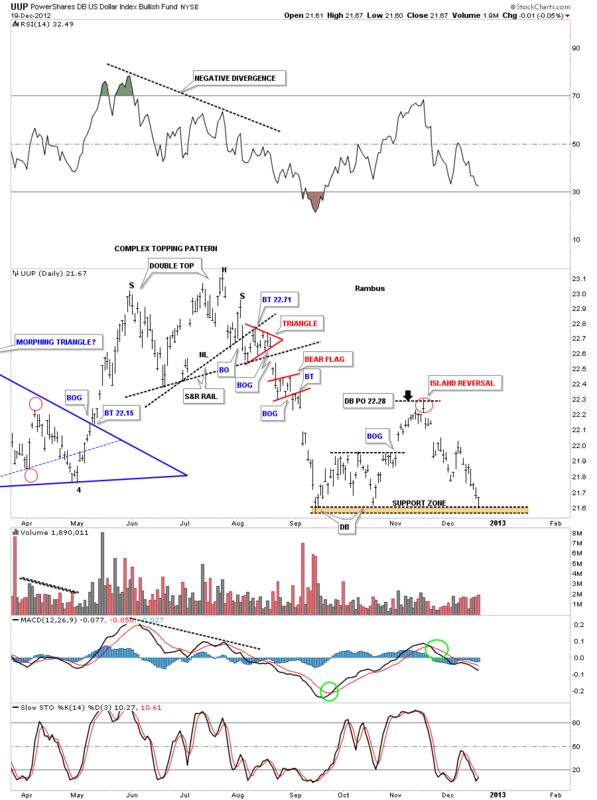 I did a post when the UUP put in the island reversal saying at the time, that this would be good for the precious metals complex and to expect the next leg up to begin anytime.This is the point where the market threw us a curve ball that took a week or so to finally figure this time ” WAS DIFFERENT” at least over the near term. With the decline off the island reversal, to our most recent low today, one would have thought the precious metals were back in rally mode but that was not the case.Today the UUP hit the previous lows made back in September and October as the precious metals complex is probing lower lows. 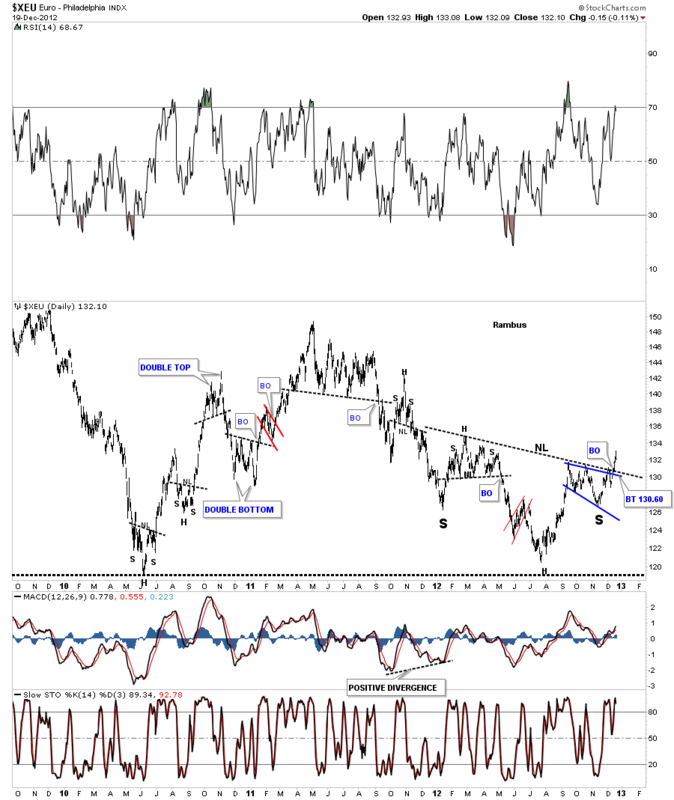 We are now at a place where we could see some type of bounce in the UUP that I’ll be watching very carefully along with the precious metals complex to see if this divergence continues to defy the normal expectations between the dollar and the precious metals complex. Lets take a quick look at the euro that is showing a possible inverse H&S bottom. We can expect a backtest to the neckline now down to the 130.60 area where we will see if the euro rally is for real. If the euro can bounce there the US dollar will continue to be weak. How that affects the precious metals complex is still up in the air until we see the normal expectations come back in play again. Lets now look at the combo chart that I’ve been showing you that shows the HUI, gold and silver. I first showed you this combo chart when gold finally broke below the bottom red trendline in the brown shaded area. As you can see the HUI actually broke down way before gold and silver as shown by the purple dashed vertical line. Now however, after silver being the strongest of the three, its now leading the way lower while the HUI has been holding up the best. 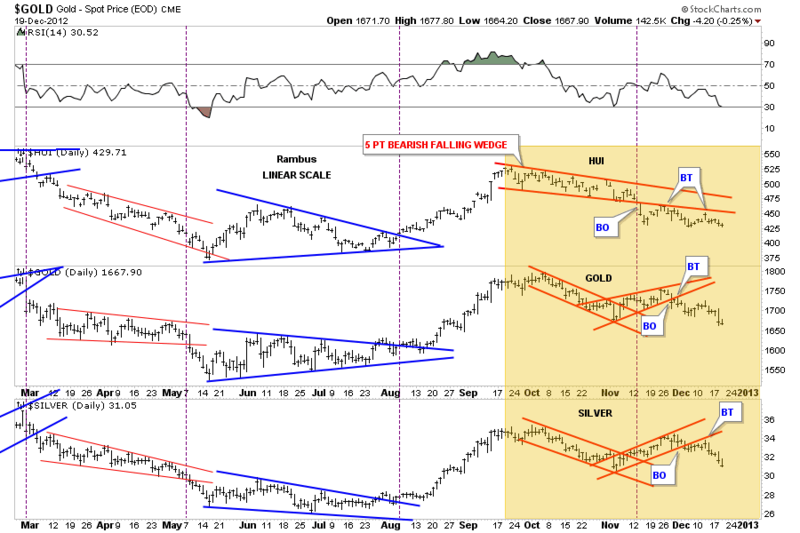 The bottom line is all three are in confirmed downtrends at the moment. 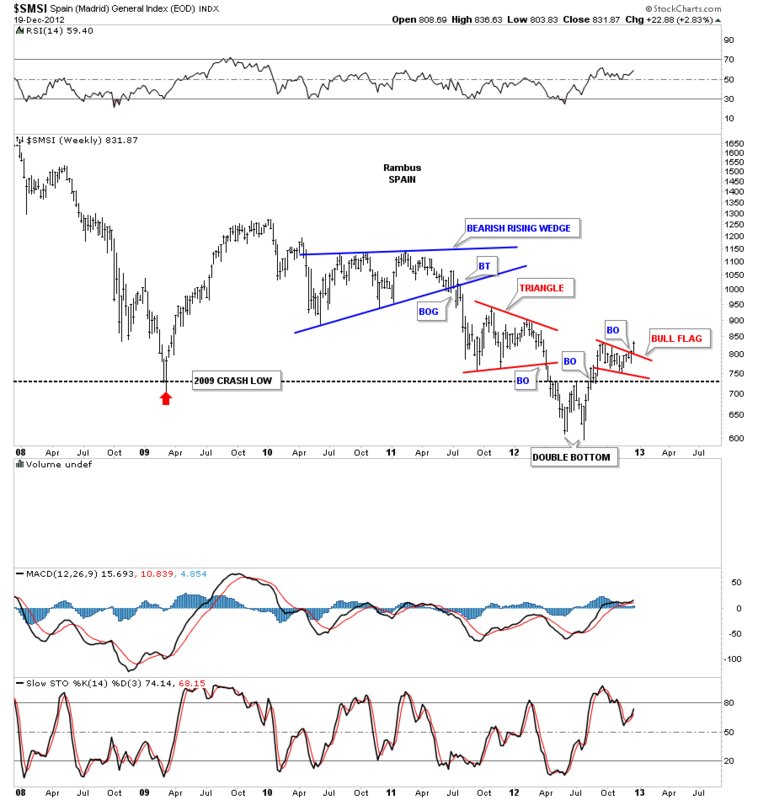 There is something taking place that alot of investors in the US are missing and that is a world wide stock market rally that has been in place for the last several months or so. I know its hard to believe, with all the negative press about the European economies being in the dumps, that they could be rallying. 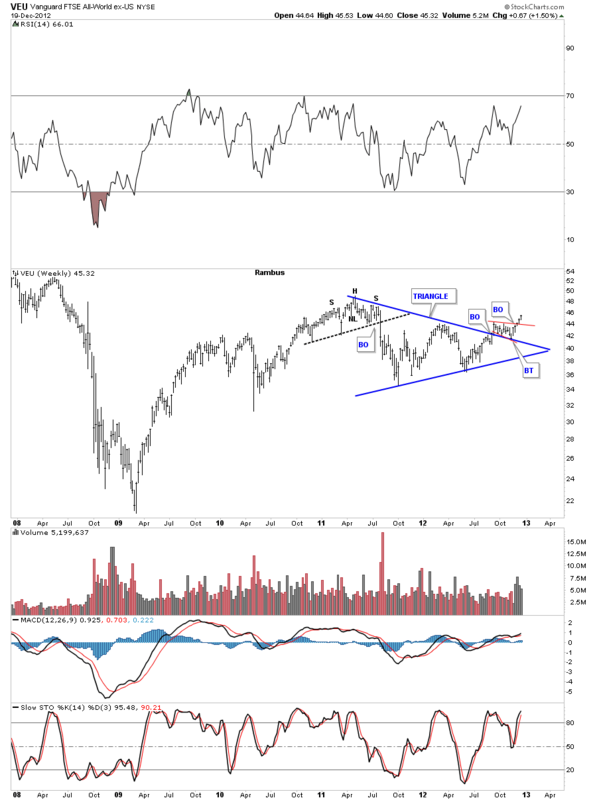 The first chart is the EUR, European top 100 etf that shows a nice big triangle that has broken out and just completed a backtest. Remember all the negative press on Spain? At the height of negativity is when this index was putting in a double bottom. This week it has broken out of a little bull flag and looks set to go higher in the near term. Italy was another basket case but has been showing considerable strength since the summer double bottom. 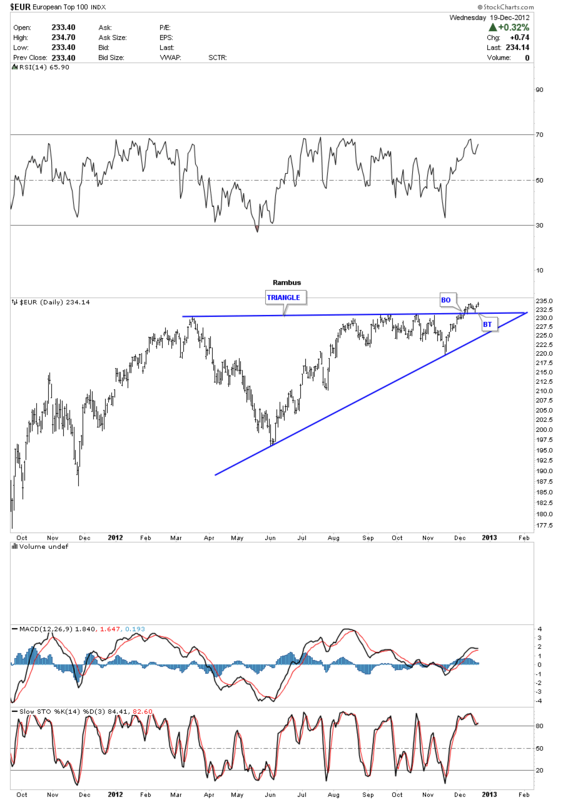 This next etf shows the emerging markets breaking out of a two year triangle with a backtest already completed. This next etf, VEU shows the world stock markets minus the US markets that could influence the chart as the US markets have been some of the strongest stock markets in the world. Rambus Chartology is Primarily a Goldbug TA Site where you can watch Rambus follow the markets on a daily basis and learn a great deal of Hands on Chartology from Rambus Tutorials and Question and Answeres .